Little fans of the Monster Machines can roll out for big action with the Blaze Monster Truck vehicles by Mega Bloks. 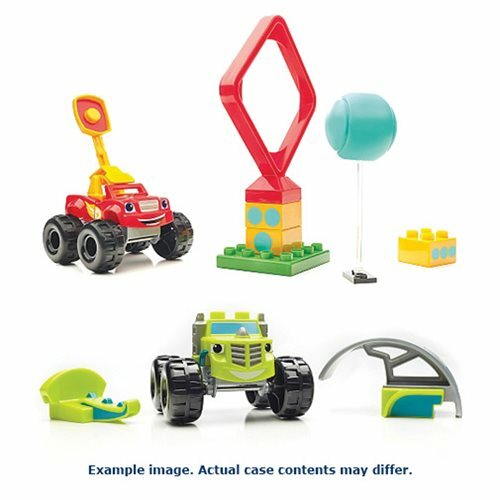 The Mega Bloks Blaze Monster Truck Vehicles Case contains 6 individually packaged vehicles. Breakdown not available at this time. With different characters from the show to collect, you can learn all about science, technology, engineering, or math when you build your Monster Machine and use the blocks and special parts to set the scene for a stadium-worthy stunt! The assortment features popular Blaze characters and unique stunts, including Smash Stunt Zeg and Truckball Blaze! Collect them all and build your Axle City (sold separately). Ages 3 and up.